Come and get your ride washed by CRG! CRG Nation, your Cajun Rollergirls are ready to wash some cars! 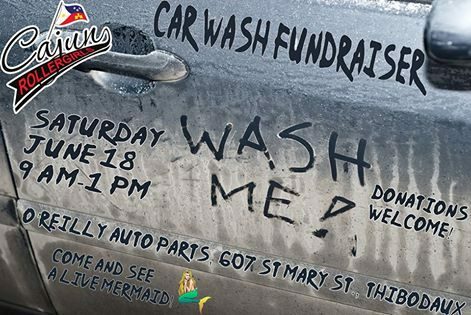 We’re holding a car wash fundraiser event next Saturday, June 18, from 9 a.m. to 1 p.m. in the parking lot of O’Reilly Auto Parts, 607 St. Mary St. in Thibodaux. Donations are welcome to help fund your local roller derby league. Plus, we’re even going to have a live mermaid! How cool is that?! CRG Falls to Acadiana Rollergirls in Youngsville, 156-95	Attention all pool players! CRG wants you!